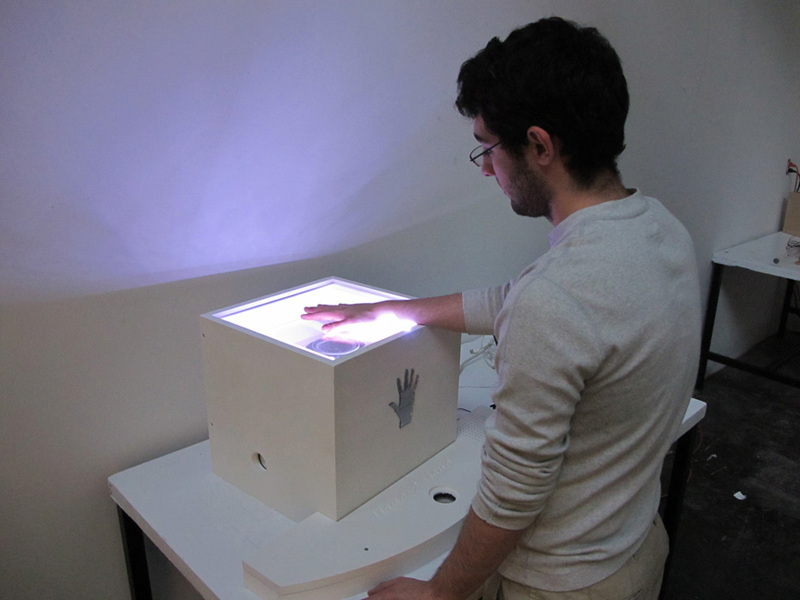 Inspired by his work with the Pittsburgh School for the Deaf, artist Matt Forrest developed the concept for a sound learning device called Hand 2 Hand. His goal was to make a tool that could be used as an educational device for the hearing impaired and allow them to experience sound in a new way. Hand 2 Hand is based on the process called Todoma, a tactual learning experience used by those who are deaf and blind to feel vibrations on the side of the mouth to better understand what the speaker is saying. The Hand 2 Hand device uses tactical sound pucks and bone conductors to enhance a range of vibrations, allowing users to feel and differentiate different frequencies. Hand 2 Hand was supported by a microgrant from the Frank-Ratchye Fund for Art @ the Frontier (FRFAF)— an endowment founded to encourage the creation of innovative artworks by the faculty, students and staff of Carnegie Mellon University. With this fund, the STUDIO seeks to develop a cache of groundbreaking projects created at CMU — works that can be described as “thinking at the edges” of the intersection of disciplines. Matt Forrest is currently a Printmaking/metalsmith Technician in CMU’s School of Art.